Nope, there's no picture here, but you absolutely have to go and see what Dot has beaded! It's a beautiful purse and is beyond gorgeous and SUCH a tremendous amount of work! 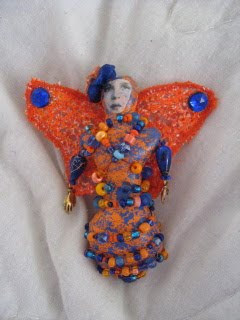 I know her work is exquisite because I was lucky enough to get one of her wee dolls in our doll group swap. Another blog I like to follow is by Rivkah and she always has interesting tutorials and information about doll making. Right now she has a good tute on How To Turn Tiny Fingers , which I have to admit is something I always seem to have such trouble with. I would have a picture for you today, but of course my camera needed to be recharged. Methinks a new camera might be in my future before long. This one only seems to take about a half dozen pictures before needing to hit the charger. I guess maybe it's tired after being used pretty much every day. Nothing creative done today either because I've been away most of the day. Over the weekend I did get my shibori pieces done for my coat (which is what I would have shown you) and also have a piece of rusted fabric to show. Tomorrow!! Before I get into the fat and fire part of this post, I am so excited that my friend Arlee Barr has a piece of her work (AND a wonderful article) in the newest issue of Cloth, Paper, Scissors!! Check it out on page 82 & 83 of the Sept/Oct magazine. Way to go Arlee!!!! Now for the fat and fire. See that picture of denim and scrumptious red fabric? Well, I've bitten the proverbial bullet and started cutting into it. (I'm going from the fat into the fire, so to speak). I hope this will be a long coat and I'm hoping even more that it will actually fit moi. I'm not a 'sewer of clothing' per se, even tho' I've made about 25 of the denim jackets. I can do those (so sayeth my brain!) because they are classified as 'crafty' not 'couture', if you know what I mean. I have a huge horror of making clothing that looks homemade, as opposed to hand made so generally avoid it like the plague. I don't quite know if I'm brave or just plain an idiot, but I plan to cobble together several patterns to come up with something I like. I hope. So far I have the denim pieces cut out and am eyeing them with the thought of hacking the sleeves apart and making inserts and maybe doing the same around the bottom. The pockets will be different too. Never let it be said that I possess a whole lot of common sense! Please meet 'Key To My Brain'!! This doll was just completed as part of a challenge on the Decidedly Different Doll Yahoo group I belong to. We were to create a doll using metal. This one is an altered doll which began as a metal Christmas tree for her skirt. The torso was a plastic doll from the thrift shop. I cut her in two at the waist (ouch!) and then gave her a lobotomy (bigger ouch!). I used cheap paper clay inside her body and to recreate the top of her head. I deconstructed a computer keyboard and some of the keys became part of her hairstyle, along with some pretty coloured wires I had kicking around in my stash. They were stuck into the paper clay before it dried. Then I painted her with some silver paint and used funky nail polish for her lips and eye colours. Her necklace is a recycled gold chain, holding an old key I found in the garage. Her skirt is mainly the metal Christmas tree with the addition of some silver beads, some little keys and some locks. Her cape is metal mesh ribbon. Here's the back view. (Each of these pictures is clickable if you'd like a better look). Before you ask, my husband thinks I'm heading for the nearest looney bin! There were the little dolls I had for exchange at the CQTeers meeting today. I came across the idea when I was re-reading one of my Art Doll Quarterly magazines (Summer 2008 issue) and thought they'd make fun little gifties. The original idea/pattern comes from Belinda Schneider. She has the instructions and pattern on her site (either under the Tutorials section, or look back in her archives to the entries of October 2007). They are very easy to make and use up little scraps, which is great. Fun! This is the little 4" doll I made to send out for a swap in our Decidedly Different Doll group. I, of course, did my usual and forgot to take a photo before sending her, so Jeanne was kind enough to forward hers on to me so I could show it here. Today I'm working on my 'homework' for our CQTeers meeting on Wednesday (which I can't show until later) and also on my metal doll (which I can't show either). You'll just have to wait to see what I'm doing! Treasures, Neck cricks, and scary stuff! Talk about a variety of items in one post...today I have it all!! My friend Marie Alton went on a road trip a couple of days ago and stopped in for a visit. She brought along the jaw-droppingly gorgeous piece of silk ribbon embroidery I won on her blog awhile back. This picture quite simply does NOT do this piece justice! 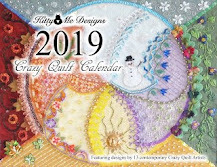 I am amazed at her wanting to part with it in the first place because it was published (along with a lovely article on how to make Melanie Roses, which were named after her daughter) in the Spring/Summer 2001 Quilting Arts Magazine. I am honoured to give it a home...thank you Marie!!! The picture above is where the 'neck crick' part of the post comes in. Why on earth my camera took both of these pictures with the same orientation and turned one sideways I'll never know! Anyhoo...this is a chair (10" high) I picked up at a thrift store. It is originally meant to hold a candle (hence the 'spike' in the middle of the seat), but it will make a very fine chair for a doll, don't you think? this is a picture of the sky out our front door approximately 8 o'clock last night. There were tornado warnings for the area, but we were fortunate and didn't get anything other than a huge amount of rain, thunder and lightening. Other places not so far away weren't so lucky. Tornados aren't a 'normal' thing in this area, so it's pretty frightening when we get dire warnings all over the tv and radio and are urged to take cover. Needless to say I wasn't about to turn the computer on last night to post to my blog!! P.S. - the 'light' showing in the upr-mid of the picture is a street light, not the sun. Here's an interesting tidbit I had never heard before...did you know that it isn't safe to go outside after a thunderstorm for at least 30 minutes after the last thunder is heard? Apparently the lightning will travel underground and can surface miles away from the strike. There is a little boy in the hospital in Toronto that happened to, so it's a thing to keep in mind. (This info was announced on both our weather channel on tv and on the radio). Stay safe! A corpse? Why, yes, it is. Several months ago Arlee arranged round three of our Exquisite Corpse challenge and my piece has come home. I love it! (To explain...each of the groups had 5 participants. The originator of the piece did the head and then covered all but 1/2" at the bottom. It was mailed on to the next member. They then added the shoulders and upper chest, again covering what they did and leaving only 1/2" visible. And so on, until all the members had completed their section. Then the piece was mailed back to the owner to be unveiled). The above picture shows the entire piece. This is the head that I began the piece with. The snakes are trapunto-ed and some are dimensional. Robin worked on the shoulders. Miles did the hips/upper legs area. And finally, Arlee finished the piece by doing the lower legs & feet. I'm thrilled with the end result. Thank you so much to all that were in my group, and especially Arlee for being the 'force' behind the project. ***Edited to add: Each section on the piece is 'finished' at 7" square. The entire piece (excluding the outside seam allowances) measures 7" x 35". Just look at what came in the mail from Jo in NZ! I won this postcard in one of her monthly drawings and I'm thrilled! You all know how much I like denim, so this is exactly right for me. Thank you so much Jo!! And speaking of Jo....she is having a big giveaway to celebrate her 600th post. Her work is beautiful, so you will want to check out her giveaway here. She has more of her beautiful work available for sale at her Etsy shop here. She also sells lovely vintage textiles at her other Etsy shop here. Be sure to check them all out to see just what she keeps busy at! Pat Winter is having a lovely giveaway on her blog too! If you haven't seen one of her sweet little wire birds nests, have a look here! 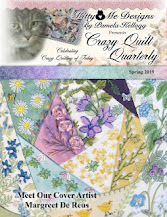 Allison Aller has directed us to a couple of beautiful crazy quilting eye candy areas. She is involved in the Alliance For American Quilts and there is a whole gallery of crazy quilts to be seen here. She has also posted some lovely pictures of antique crazy quilts here. I'm on a winning streak! I received an email from Planet Purl to inform me that I had won the draw for July and will be receiving 16 (!) balls of yarn (Muench GGH Linarte) and a pattern to make a sweater!! Wow! At the rate I knit sweaters, don't expect to see the finished product for at least three years. It will be such fun to receive some really good wool for my stash, instead of using the cheapie stuff from our local dept. store! 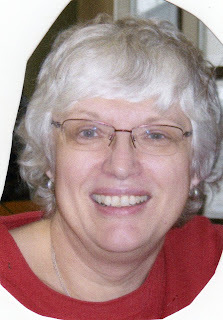 Last, but certainly not least, Mary Corbet is running a series on Long & Short Stitch on her blog. Her guidance is superb, so if it's a stitch you aren't comfortable with, be sure to have a look. I know it's one I will need to spend some time practicing. (There are links at the bottom of her current post that will lead you to the other lessons). If you haven't taken time to look around on her blog, please do. I guarantee you won't be disappointed! Here's a couple of experiments I'm doing to create some rusted fabrics. The piece on the left has a heavy cardboard tube in the centre, wrapped with steel wool, and then fabric. The other is a rusty metal pole the guys had lurking in the garage, also with fabric wrapped around it. Both were soaked with vinegar and set outside in the sun to 'cook'. The steel wool is rusting beautifully and is really showing a lot of colour. The other one, not so much. Today I went out and dosed them again with more vinegar, so we'll see what happens. The fly influx seems to be abating somewhat, thankfully! At least I'm not feeling as though I have to continually look up for fear some are about to dive bomb me!! Yep, we're still swatting the flying hordes. Right now I can see eight on one light fixture in my studio, but I don't dare swat them there for fear I shatter the bulbs. Considering that I have three double lights in my room, you can just imagine how many are hovering over my head! The cats think we provided all these flies just for their entertainment (but I think they're even getting bored). Yeewww. I returned to work on my 'metal' doll and pulled a few things out of my component box for possible use. I also spent some time tearing a computer keyboard apart (who knew there was all that usable stuff!) and also tore apart an old electric alarm clock. I'm liking all the gears and washers and interesting little 'bits' that are going directly into my component box for future reference. Hey Arlee...recognize some of the bits in the pic? Yeah! Something got finished today (well, almost). This is the ring bearer pillow I was commissioned to do which has been sitting half finished for too long. The wedding is in September so I thought it was high time I got it done. I finally mustered the courage to stitch a monogram (thanks to Mary Corbet!) and I'm pretty pleased at how they turned out. There was a bit of minor puckering around the letters but I think that is due to the type of fabric I used. The whole thing is approximately 9" square. Now I have to scrounge around to find some small plastic rings so that I can attach the ribbon to hold the wedding rings. I want that to be removable after the wedding. This outta do permanent damage to your computer!! This morning I've been faffing about trying to find and print a semi-decent picture of me to include with the journal that is travelling with the art dolls. I HATE having my picture taken so there are very few of them around. The above photo is of the final two pages I did on the journal (clickable so you can englarge). Below is a photo of the cabinet card I bought this morning at an antique shop. I fell in like with her - she looks so sweet and innocent. At some point she will be featured in a piece of art. I really wish I was independently wealthy because I would have picked up a whole bunch of these (at $5 each, they are a bit pricey). It's such a total shame that people get rid of them...nameless, dateless and unloved. So sad. Makes me doubly sure that being meticulous about putting names and dates on each and every picture I have is so important. There was a gorgeous old photo album, chock full of these cab cards, for sale ($95)...no names on any of them. Really wish I could have afforded to give it a home! These are two of the journal pages I made to go along withKyra. The above page is painted and heated tyvek. I added beads and a knitted 'bit' of the yarn I used to make her talisman bag. Behind the tyvek is some green fabric which peaks through the holes. The green represents the earth that is being consumed by lava as Kyra has a temper tantrum. Below is another page, this time simply painted white paper, with a coat of water base varnish to seal it. I printed off the pictures I had of what I did with her face and head and surrounded them with more of the yarn used previously. The flowers are buttons (with the shank removed) as is the sun and her purple crown. Finally managed to combine some time at home AND some sunshine to take pictures! Above is the absolutely gorgeous wee doll that Dot made for me in the 3-D doll swap. Just look at the wonderful details and all the beads! I am in total awe and keep picking her up and admiring her. She is so perfect. Thank you SOOO much Dot!! Above and below are pictures of what I've done with Kyra (from the Art Doll Coolaberation). She's quite a feisty little miss and has informed me that she wants to be a volcano goddess; cousin of Pele, the Hawaiian goddess (She-Who-Shapes-The-Sacred-Land). No matter that I had a rather sedate serene personsa in mind - she was not having any of it. So, after much discussion, I decided to go with the 'flow' (lava).